In a multi-tier affiliate program, the affiliates are related with each other among two or more levels. 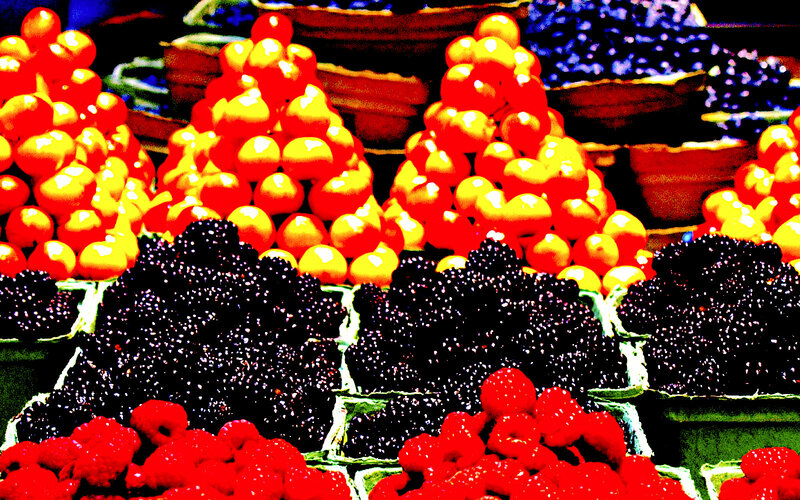 The level zero or first tier is the same as in a regular affiliate program. The difference in a multi-tier program stems from the additional tiers – marketers also earn a commission on sales generated by other participants that they referred to the program. Affiliate tiers is one of the most powerful features of the Affiliates Enterprise plugin for WordPress. Tiers allow you to create networks of affiliates, where new affiliates are assigned to their referring affiliate. In terms of referrals, they will also grant tiered commissions to their referring affiliate. An affiliate can have more than one network of affiliates, without any restrictions regarding the dimensions or the number of affiliates. Multi-level Marketing or Pyramid Scheme? So what’s the difference? Pyramid schemes serve a disgraceful purpose – the entire purpose of a pyramid scheme is to deceive people, to get your money and use you to recruit more unfortunate victims. MLM or Multi-Level-Marketing has little to nothing to do with that, MLM is used to promote a legitimate business that offers real products or services which provide genuine value to its customers. And that’s what this post is about. Original Referrer – abbreviated as OR – is the affiliate who refers a new lead, a new customer or a transaction as for example a purchase order. This referral in turn, can produce tier referrals. The meaning of OR is abstract, because we don’t set a particular affiliate to be OR. Each time a referral is recorded, the OR is the affiliate involved in that referral. For example: Affiliate A refers a new sale – Affiliate A is the OR here. A referral is recorded and a commission is granted. If Affiliate A has been referred by another affiliate, Affiliate B, a tiered commission will be granted to Affiliate B. Referrals can occur whenever an action takes place on the site running the affiliate program. A referral can occur because of a referred sale, booking, form submission etc. On the other hand, Tiered Referrals may occur only whenever there is a Referral recorded on the same site. Affiliates Enterprise supports an unlimited number of Levels of Tiers*. Basically, this means that our system can grant unlimited tiered commissions per referral. Whenever the OR records a referral, referring affiliates in all levels can benefit with a tiered commission. * A soft limit of 111 levels is imposed unless the AFF_ENT_UNLIMITED constant is defined. Rates system – all the commissions are set in one place, under Affiliates > Rates. Legacy system – each commission is set individually depending on the feature or integration we are setting up. This system is still supported by Affiliates Pro and Enterprise for backwards compatibility. Go to Affiliates > Rates and add a new rate. Select Rate and set a Value. For the Level field, choose the level number. Further information on using rates is available on the Rates documentation page for Affiliates Enterprise. Go to Affiliates > Tiers and under Level Rates section set a rate per level. Regardless of which system we decide to use, the process is the same. Whenever a referral is recorded, the referrer of OR will get a tiered commission based on the rate at Level 1, the referrer of the referrer will get a tiered commission based on the rate at Level 2, etc. As I mentioned, the meaning of OR is abstract but it determines how the system calculates the levels. Let’s see some more details to explain the flow that takes place in the background. Assume that we have set rates for Level 1 and Level 2 and there are the following relations between our affiliates. Affiliate A has referred Affiliate B. Affiliate B has referred Affiliate C.
Affiliate C refers a new sale. Affiliate C is considered the OR and gets a referral and commission because of the new sale. Affiliate B will get a tiered commission based on the rate set for Level 1, as the referrer of Affiliate C.
Affiliate A will get a tiered commission based on the rate set for Level 2, as the referrer of Affiliate B. Affiliate C has referred Affiliate D.
Affiliate D refers a new sale. Affiliate D is considered the OR and gets a referral and commission because of the new sale. Affiliate C will get a tiered commission based on the rate set for Level 1, as the referrer of Affiliate D.
Affiliate B will get a tiered commission based on the rate set for Level 2, as the referrer of Affiliate C.
Please note that in this case Affiliate A will not get a tiered commission, because we have set rates for two Levels of tiers. The same would happen if we had set the number of Levels to 2 under Affiliates > Tiers. 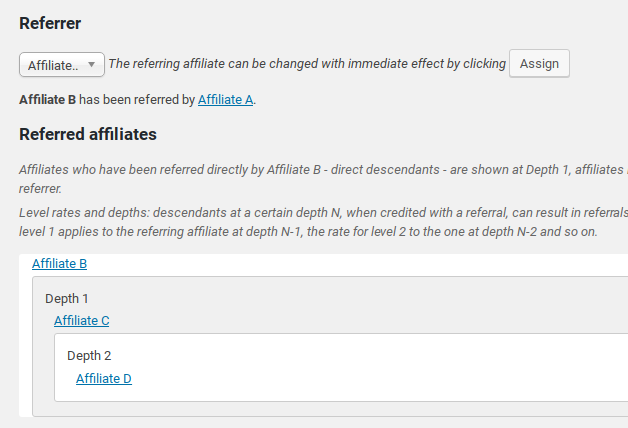 The relations for an affiliate can be seen in the Dashboard if we visit Affiliates > Manage Affiliates and click Edit. There is a section called Tiers that displays the Referrer and Referred affiliates. The Referrer will show the name of the affiliate who has referred the affiliate we currently edit. If not set, then the affiliate has no referrer. The Referred affiliates will show the complete tree of affiliates referred by the affiliate we currently edit. If nothing shows up, then the affiliate hasn’t referred any other affiliate(s) yet. Affiliate A will be the Referrer. Affiliate C will be under Depth 1. Affiliate D will be under Depth 2. The features around tiers that are built into Affiliates Enterprise are powerful yet easy-to-use tools, that will help you expand your appearance on the internet even more. Once you fully comprehend the basic concept, setting up an affiliate network will become an ordinary task. To follow up Karim’s reply and cover your question regarding ranks, I have implemented a Ranking system for Affiliates Pro and Affiliates Enterprise which you can obtain here and use for free. This plugin allows you to automatically promote affiliates based on their referral performance. Each Rank can use its own user-defined Rates and the main idea is to give better rewards-commissions as they advance through the ranks. Each time an affiliate registers through the affiliates registration form, he will be added automatically to Rank 1. In order to be promoted to the next rank, Rank 2, the affiliate must have referred at least 20 referrals and so on…. When a customer purchased, he has not referred any, wouldn’t the 1st condition be set to 0? In my case, it would be 0, 2, 4, 6, 8, 10 referrals sales? Do I change the class-affiliates-rankings.php code to indicate this? I don’t know how the filter API works. So it is not something that I will see in AE that I can set? Assuming this all work as planned, if an affiliate has referred 4 sales, and he is promoted to Rank 3. Rank 3 would have access to 3 levels of commissions (Level 1 – 10%, Level 2 – 2%, Leve 3 – 2%) Where would I set the individual levels and % for each Rank? The Rank names, aka group names are just a matter of perspective. The way I built the extension, you can set different names for the ranks, especially if you use the snippets. It’s up to you to set 7 Ranks for promotions and 7 conditions. Each time by adding the example snippet provided and only modifying the two arrays. Once you have installed the extension, you should add the respective rates for each one of the groups. Affiliates Pro and Affiliates Enterprise since version 3 utilise Rates system that allows you to set commission rates with dozens of different combinations. A detailed description of how to use Rates can be found in the documentation. In general, when you are buying a plugin(s) from itthinx.com, a support period is included in your license where you get help on how to setup your plugins to suit your needs. I want to make it a true MLM. That means that I will only allow paying customers to become an affiliate. Can this be set up? Can affiliate be classified into different ranks where each rank has access to different levels of commissions? e.g. Rank 1 and access level 1 commissions, Rank 2 can access level 1 & 2, Rank 3 can access level 1, 2, & 3 and so on up to Rank 6. How the affiliate rank will depend on how many direct referrals/sales they make. Can this also be set up? Thanks. MLM is supported by Affiliates Enterprise plugin. Tiers feature allows you to offer multilevel commissions and the process is described in detail as you have already read on this post. Regarding making paying customers affiliates and offering ranking functionality these are not supported at the moment but can be easily added. Can I make it so that ONLY paying customers can become affiliates? The ranks have different access levels. Can AE be set up so each rank has different access levels? How to do make the Enterprise version do what I want? I want to make sure it can do what I want before purchasing. Is there a demo? Thanks. Actually this is supported but you need to use an additional tool for it. Assuming that all your registered users are customers, then you can use Groups to restrict access to the affiliate registration by restricting access to the affiliate registration page based on the Registered group – this documentation page provides details. You can take it a step further and actually sell affiliate memberships using Groups WooCommerce – for example you can set up a group “Ambassadors” and restrict access to the affiliate registration page using that group. When you combine this with a product that assigns the customer to the “Ambassadors” group, you can charge for unlimited or time-limited affiliate memberships. George has prepared another solution which is pretty cool based on ranks. He’ll follow up on that here. Thanks, Kento. This is great. Since I want my MLM to sell products, that means that I have to assign every customer starting from say, Rank 1 when they purchased? Is Group WooCommerce included as part of the Enterprise or have to purchase separately? I hope it is because the Enterprise version is supposed to be made for MLM business. Is there an AE demo that I can see the features? Thank you. As I have mentioned, I only want customers to become affiliates and limit the access to affiliate registration/area with only the customers. You mentioned that it can be done by groups. When a customer purchased from WooCommerce any of our products, I guess I need to assign them a group/rank, say Rank 1. Only these have access to affiliate area/registration. In this case, do I need that Groups WooCommerce plugin? If you want automatic assignment based on a product purchase then yes you would need Groups WooCommerce. Otherwise you could also do it manually. Great post on all things affiliate tiers. This will serve as a great resource to refer people to confused about this topic. Affiliates Tiers is a powerful feature and pretty easy to use once you understand the concept.